Cheering Team U.S.A. to victory is hard work and requires a great deal of fuel. Fortunately, it’s easy to find British cuisine in Chicago that meets Olympic standards. Want a modern twist on classic British grub? Visit the inviting Blokes & Birds (3343 North Clark Street) in Wrigleyville. The mustached menu is full of entertaining puns as well as spicy curries. 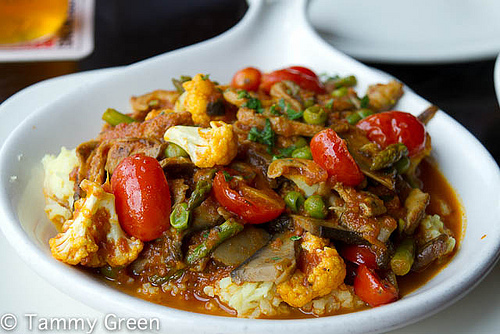 If you’re feeling adventurous, try the vegetarian Edgy & Angry served atop Basmati Rice. The Buckingham Baked Mac n’ Cheese or the Posh on Becks, bacon-wrapped dates, are a bit blander though equally rewarding. The fun cocktail menu includes gems like The Queen’s Jubilee with grapefruit and vodka, or the Strawberry Fields Forever with Hendricks gin and strawberries. However, opting for an English brew like Wells Banana Beer is an interesting way to round out the meal. Bonus? The Olympics are on screen during dinner so you won’t miss your favorite event. Owen & Engine (2700 North Western Avenue) offers rustic British fare in a classic pub setting. Love fish & chips? 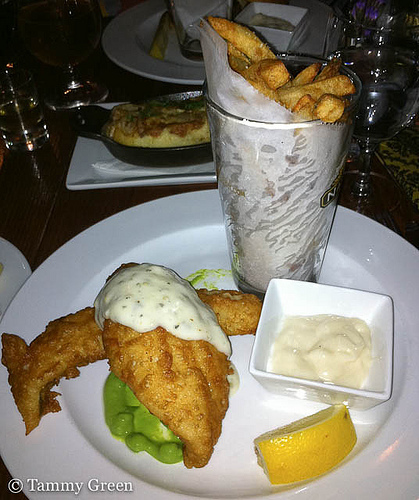 The tender haddock served atop pureed spring peas with thick fries and malt aioli are satisfying and delicious. I find it hard to resist the house-made pickles or their hearty take on bubbles & squeak, an amped version of a potato pancake. Owen & Engine is also a pub, so hoist a glass of English Bitters or a local craft brew with dinner. There aren’t any TV screens here, so head to the outdoor patio if the weather permits. Whether your choose from a modern or classic take on British cuisine, you can guarantee a gold-medal finish to your meal with these restaurants. This entry was posted in Dining and tagged Blokes & Birds, bubble & squeak, curry, fish & chips, Owen & Engine. Bookmark the permalink.